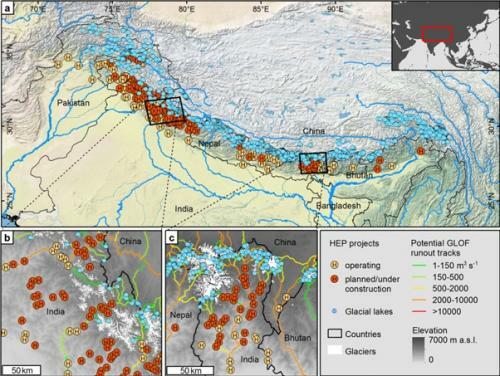 In a research paper published in the journal, IOPScience, researchers pointed out that hydropower projects (HPPs) built in the Himalayas in close proximity to glacial lakes pose risk to the fragile environment. The study was conducted by researchers from Switzerland and Germany, who conducted simulations by using a model called “flood-wave propagation” to show how water would flow downstream in case of a flood upstream. The Himalayan belt has over 2,300 glacial lakes that are melting due to global warming. For the study, the researchers selected 257 HPPs to assess the risk the dams pose to Glacial Lake Outburst Floods (GLOFs). GLOFs occur when lakes formed by melting glaciers overflow. An increase in the demand for electricity has led to the construction of a large number of HPPs upstream near glacial lakes. The red dots in the map show planned HPPs in the Himalayan region. The study shows that plans for 149 HPPs have been submitted by India as part of the Clean Development Mechanism defined in the Kyoto Protocol. According to the United Nations Framework Convention on Climate Change, the mechanism allows a country with an emission-reduction or emission-limitation commitment. The HPP projects are submitted as emission-reduction projects by countries to earn carbon credits. A total of 441 projects have been planned by Bhutan, China, India, Pakistan and Nepal in the Himalayan region. According to the researchers, there is little available information on some key points to help us accurately identify high-risk projects. For instance, even though there is adequate information about a particular area with a large number of glacial lakes, the volume of water they contain is yet to be ascertained. This is an important factor that makes it difficult to assess how a flooded glacial lake will affect HPPs lying close to it. Another factor that adds to the uncertainty is the distance between a dam and a glacial lake. As the distance increases, it becomes easier to predict the impact of a GLOF in an area dotted with HPPs as the force of water flow reduces as it rishes downstream, experts say. Dams built downstream may not have the same risk impact as those built upstream. “We stress that it is not the exact number of hydroelectric power projects that worries us, but rather the lack of certainty with which general statements can be made about these projects’ safety,” Schwanghart added. Lack of certainty sometimes leads to inaction. The study points out that if we do not attempt to fill in the gaps in our understanding of the Himalayan region, we will be more prone to disasters. 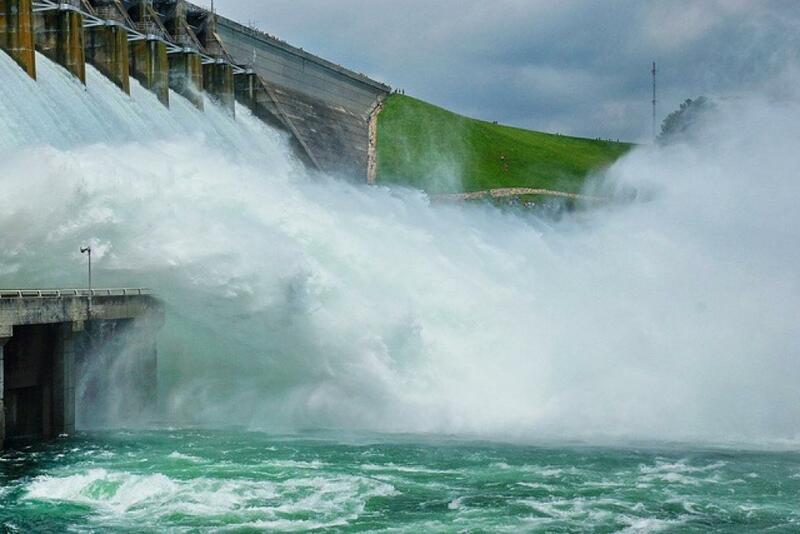 India is the seventh largest producer of hydro power in the world according to the US-based Energy Information Administration. The study says that if all the proposed projects are completed, the Himalayan region will have the highest density of dams in the world. The study cites another research which shows how dams brought on the Uttarakhand flood disaster in 2013. In June 2013, torrential rains raised the water level of the Chorabari Lake in Uttarakhand. The lake was moraine-dammed (moraine is accumulated glacial debris comprising soil, rocks and ice). The dam gates breached and 4,00,000 cubic metres of water rushed into the already flooded Mandakini river, inundating the pilgrimage city of Kedarnath and severely damaging at least two HPPs downstream.